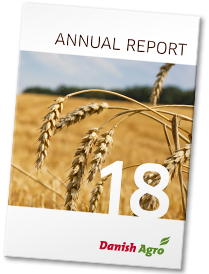 The long, drawn-out drought from April to August provided challenges for Danish Agro group in what was otherwise a good 2018 for Danish Agro. Financially, the group performed well in ten months of the year, but experienced problems in August and September because of the drought. Teh drought meant that pre-tax profit for the year landed on DKK 447 million, 166 million down on the preceding year. Despite the drought, turnover reached DKK 33 billion, which is 1.6 billion higher than the preceding year – an increase of 5%. Higher prices can take some of the credit, but increased levels of activity throughout the group were also responsible.